Stamped concrete is one of the strongest and most versatile building materials. In the blink of an eye, you can replicate stone, brick, or any other paving material without getting on your hands and knees and laying stone. However, there are many misconceptions about stamped concrete. Find out the truth before making up your mind about this great paving option. One of the coolest aspects of concrete is that is can be poured on many different surfaces. 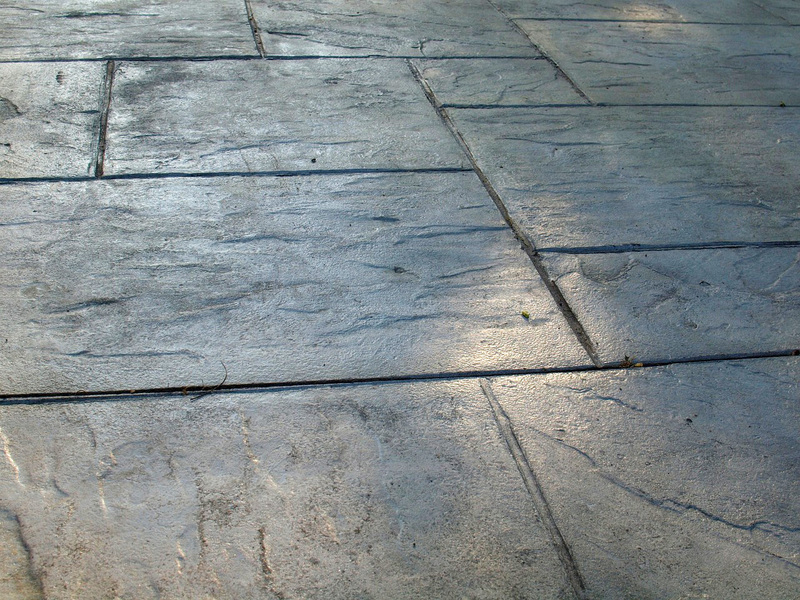 Stamped concrete can come with a high gloss or normal matte finish, depending on the sealer. It can look smooth as glass or rough as sandpaper. However, no matter the finish, stamped concrete differentiates itself when you stamp it. With all the varying textures you can add to concrete and the different stones it can mimic, stamped concrete is a truly non-slip surface looks like stone, brick, or pavers. We can’t tell you that your concrete won’t crack because it will. However, stamped concrete isn’t more likely to crack than a regular concrete surface. Any concrete can crack in less than ideal conditioners. Stamped concrete is one of the most durable and long lasting paving materials available. It is highly resistant to cracking when installed correctly. Concrete can be mixed to improve resiliency and protect against seasonal temperature changes and inclement weather. Protective sealants and color hardening additives also further protect your surface. In fact, knowing how to properly maintain your concrete investment is one of the most important steps towards making it last as long as possible. Like with every job, sometimes people just do a bad job. Yes, there are stamped concrete jobs that don’t look like real stone. There are also artificial flowers that don’t look like anything you would find at a high-end hotel. However, we can pretty much guarantee that you have walked on a stamped concrete job that you thought was real stone. In most cases, stamped concrete is indiscernible from real stone. At Bravo! Buffalo, we specialize in faded and dulled stamped and decorative patios and other surfaces that need to be restored to their original beauty. Your concrete will not only look like real stone, but it will be as beautiful as it did on the first day. Any material is susceptible to losing some of its sheen over years of wear, exposure, and UV radiation from the sun. This is another reason why using a high-quality sealer is so important. Not only will it protect your concrete from water and environmental dangers, but it will also protect your concrete from fading. Experts recommend resealing every 2 or 3 years. If you wait longer, you may notice the color fade. However, with regular sealing, your concrete will look as vibrant as the day it was installed and stay around for decades. When compared to other options, like pavers or natural stones, stamped concrete is actually available at a similar cost. Adding to the value of decorative concrete is the material’s inherent strength and endurance. Like conventional concrete, stamped concrete will provide decades of service when properly installed and maintained, even when exposed to harsh winter weather conditions. Plus, when you factor in the labor of installing stones versus poured concrete, the savings quickly add up. Spring is just around the corner. Interested in Stamped Concrete? Contact Bravo! Buffalo today for your free estimate!